(Newtown, PA – March 1, 2016) –Conrad Emmerich, vice president of clinical operations at Wake Forest Baptist Medical Center, will take the stage at this year’s HIMSS Conference & Exhibition to discuss how Enterprise Location Services are transforming hospital operations, increasing ROI and dramatically improving the patient experience. Wake Forest Baptist Medical Center, a nationally acclaimed academic medical center based in Winston-Salem, North Carolina,has long been recognized as one of healthcare’s most-advanced users of Enterprise Location Services. With over 50 deployed use cases addressing workflow, resource management, and patient throughput, the CenTrak user has realized significant financial benefits.Since 2012, Wake Forest Baptist has achieved more than $10 million in quantified value through the deployment of solutions based on CenTrak’s Enterprise Location Services. With the support of Infinite Leap, a CenTrak Edge™ Systems Integrator, and Intelligent InSites RTLS software provider, Wake Forest Baptist has expanded its use of Enterprise Location Services beyond traditional RTLS use cases. The facility is currently focused on implementing advanced location-enabled applications and identifying opportunities for continued innovation which enhance staff and patient safety and operational intelligence,while providing the ultimate patient experience. CenTrak’s Location Adoption Model (see graphic) leverages six different technologies including Wi-Fi, active RFID, Gen2IR, Low Frequency, BLE (Bluetooth Low Energy), and passive RFID. 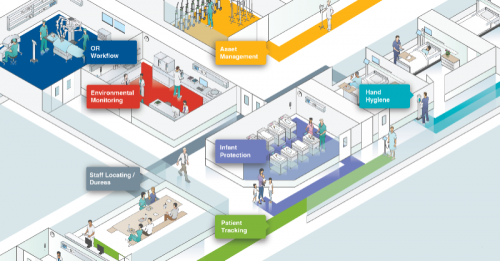 The offering is tethered by the industries only Clinical Grade RTLS which delivers certainty-based location information segmented into clinically relevant spaces such as patient rooms, beds, bays, chairs, nursing stations, hallway segments, choke-points and hand-hygiene dispensers (see graphic). Attend Mr. Emmerich’s session at HIMSS16 titled, “RTLS 2.0: Enterprise Visibility Revolutionizes Healthcare” on Thursday, March 3 at 8:30 a.m. PT in the Sands Expo Convention Center, Palazzo D and stop by CenTrak’s booth #6828 to participate in a demonstration and learn more about its Enterprise Location Services and Clinical-Grade RTLS.